Potato and Beef Pie - Oval shape pie, minced beef with potatoes in a gravy base contained within a substantial short crust pastry. The popular traditional Clark’s pie recipe was developed many years ago and has mostly remained unchanged. Out trademark CLARPIE is stamped into the base of every pie. If it doesn’t have CLARPIE – it’s not a genuine Clarksie! Potato and Beef Pie - Round shape pie, minced beef with potatoes in a gravy base contained within a substantial short crust pastry. 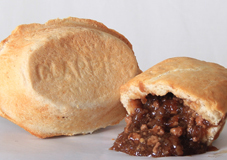 The same great taste as our large pie but a smaller size more suited to smaller appetites. CLARPIE trademark stamped into the pastry base. 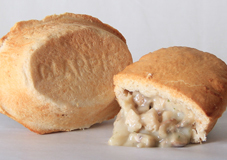 Chunks of chicken and pieces of mushrooms in a creamy white sauce all encased within a substantial short crust pastry. 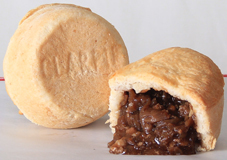 A new product introduced in 2011 that provides a smooth and tasty addition to the Clark’s Pie family. The vegetarian option available from Clark’s. 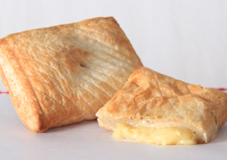 This cheddar Cheese & Onion pasty has a unique blend of seasonings in a puff pastry case.